Michael Cohen, once undeniably devoted to Donald Trump, is now about to spend days on Capitol Hill testifying against him. A Manhattan-based lawyer, Cohen began working for him well before the 2016 campaign and election. During the campaign, he was a prominent spokesperson, often appearing on news shows and vehemently defending then-candidate Trump. 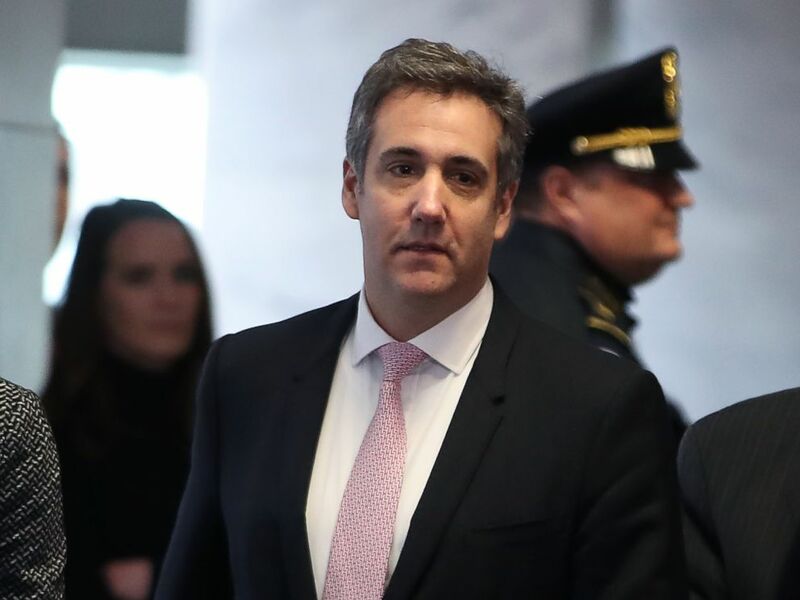 In fact, for more than a decade, Cohen stood by Trump's side as his personal attorney, fixer and confidant, famously proclaiming that he would "take a bullet for the president" and "never walk away." But over the first two years of Trump's administration, as investigators targeted Cohen's personal finances, he flipped on his former boss and cooperated in multiple investigations, including special counsel Robert Mueller's probe. It was ultimately hush-money deals with two women who said they had affairs with Trump -- affairs the president's denied -- that brought Cohen into the spotlight. In December 2018, Cohen was sentenced to three years in prison for various crimes, including campaign finance violations, tax evasion and lying to Congress. 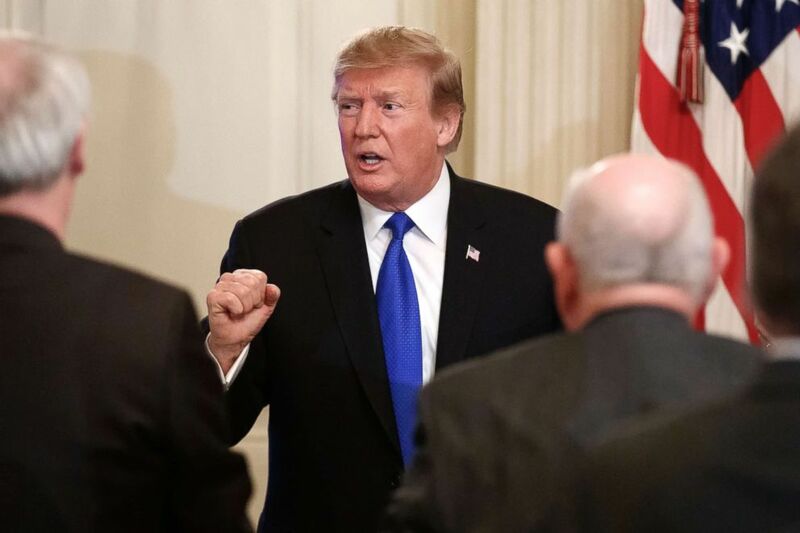 President Donald Trump greets people as he leaves the State Dining Room of the White House on Feb. 25, 2019, after speaking at the 2019 White House Business Session with Our Nation's Governors. Cohen initially came under scrutiny after acknowledging that he made a $130,000 payment to adult-film actress Stormy Daniels as she was shopping her story of an alleged affair with Trump in 2006 to major media outlets shortly before the 2016 election, a story first reported by The Wall Street Journal at the beginning of 2018. A few months later, in April, Cohen's home and offices were raided by the FBI -- a turning point in his relationship with the president. A source close to Cohen said the FBI seized documents related to the Stormy Daniels matter, as well personal, financial and banking records dating back to 2013. Initially, Cohen said the president had no knowledge of two payments made -- one to Karen McDougal and one to Stormy Daniels, both of whom claimed past affairs with Trump. But federal prosecutors later alleged he acted "in coordination with and at the direction of" Trump. Trump has argued the payments amount to nothing more than a "simple private transaction," and do not qualify as campaign finance violations. In the midst of it all, Cohen stopped representing the president as his personal attorney. In August, Cohen agreed to a deal with federal prosecutors in the Southern District of New York and pleaded guilty to eight counts, saying that he made illegal campaign contributions "in coordination and at the direction of a candidate for federal office," who was Trump. A month later, news reports broke that Cohen had participated in a month-long series of interviews with investigators from Mueller's office. In November, Cohen struck a second deal -- this time with Mueller -- pleading guilty to lying to Congress about the Russia investigation. When he was sentenced at the end of 2018, the judge on the case said "Cohen plead guilty to a veritable smorgasbord of fraudulent conduct" and "lost his moral compass," adding that "as a lawyer, Mr. Cohen should have known better." In addition to three years in prison, Cohen will have to pay $1.39 million in restitution, plus $500,000 in forfeiture for the financial and campaign finance crimes. He will face an additional fine of $50,000 for lying to Congress. Cohen sat for an interview with ABC News after his sentencing. "I knew what I was doing was wrong," Cohen told ABC News' Chief Anchor George Stephanopoulos in December 2018. "I stood up before the world [Wednesday] and I accepted the responsibility for my actions." Cohen said he was "angry at himself" for his role in the deals, but that he did it out of "blind loyalty" to Trump. "I gave loyalty to someone who, truthfully, does not deserve loyalty," he said. His testimony before the House Oversight Committee will be the first time he publicly pulls back the curtain on 10-plus years by Trump's side. He's also testifying behind closed-doors before the Senate Intelligence Committee and the House Intelligence Committee. Like Trump, Cohen supported Democrats in the past, including then-candidate Barack Obama in 2008. During his 2011 interview with ABC News, when Trump was publicly speculating about running for president in 2012, Cohen said that he was "prepared to put the fact that I voted for Obama to the side." But Cohen, reportedly referred to as "Tom" around the Trump Organization offices in a nod to "Godfather" character Tom Hagen, who was the consigliere to Vito Corleone, was clear about his support for the president. "It means that if somebody does something Mr. Trump doesn't like, I do everything in my power to resolve it to Mr. Trump's benefit," Cohen told ABC News in 2011. "If you do something wrong, I'm going to come at you, grab you by the neck and I'm not going to let you go until I'm finished," Cohen added. Fast-forward to Trump's actual presidential bid and Cohen was an ardent supporter of his friend in the Republican primary. It wasn't until after Trump was in office, however, that Cohen officially became a Republican. On March 9, 2017, Cohen posted a picture of himself appearing to sign the paperwork and "[make] the official move" to joining the Republican Party. "It took a great man (@POTUS) to get me to make the switch," he wrote. His party switch was followed shortly by an announcement from the GOP that he was added to the Republican National Committee's finance leadership team as national deputy chairman. 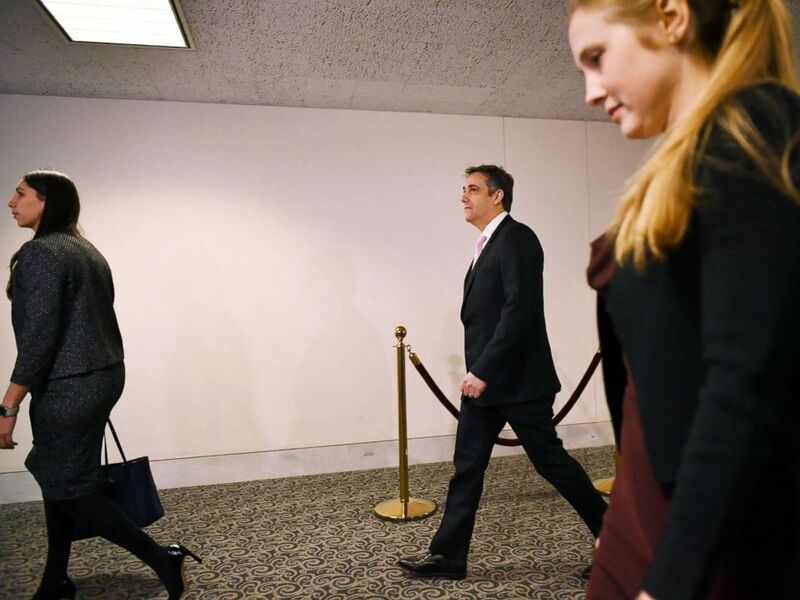 Michael Cohen, President Donald Trump's former personal attorney, arrives at the Hart Senate Office Building in Washington, Feb. 26, 2019. This isn't the first time that Cohen switched to the Republican Party, however, having run a failed bid as a Republican for an Upper East Side city council seat in 2003, according to real estate news site The Real Deal. Well before that, his other earlier forays into professional politics came on the Democratic side, including volunteering for Michael Dukakis' 1988 presidential campaign and working as a legislative intern for former Rep. Joe Moakley, D-Mass. While Cohen's public image is intrinsically intertwined with Trump, he has shared some tidbits of information about his personal life online as well. Cohen has used his online presence to praise his "Ivy League daughter," which prompted some outcry since it was accompanied by a picture of her modeling in tights and lingerie. And he's defended himself against claims of being a racist by posting that he is the "son of a Holocaust survivor" along with a collage of photos of him with various African-American Trump supporters. But the most constant topic of conversation on Cohen's Twitter account was undeniably the Trump administration, members of the Trump family, and Trump himself. It shows the long history between the current president and his former fixer, which dates back long before Twitter was even around but was well documented on Trump's preferred social media site. In a declaration of support for Trump's birthday in July 2017, Cohen shared a picture of them together in what looks like Trump's New York City office. "I stand with you every day as you work to #MakeAmericaGreatAgain for all Americans!" Cohen wrote. ABC News's Meghan Keneally contributed to this report.